Fast delivery! Vast majority of orders arrive within 1-2 days. Free delivery over £20. See what our customers have to say! Click on Images to Enlarge. Delivery £2.95 for this item (Inc. VAT), or FREE if you spend over £20. Silver finish dragon standing over a bed of crystals. 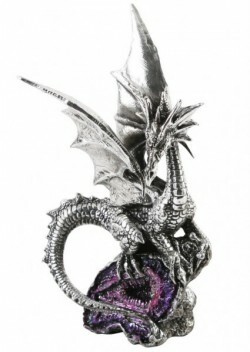 This dragon sculpture is from the Mystic Legends range from Juliana. Check out the rest of the Mystic Legends collection in this section! 20 cm tall (8 inches). Ask us a question about this product. Orders are shipped via First Class Royal Mail Service. Items usually delivered within 1-2 working days. We accept all the major credit and debit cards. All payments are processed securely using 256-bit Encryption. We can also accept payments via paypal or cheque. Our Price Promise and no-quibble Returns Policy are to ensure your peace of mind.